Hideaway House01263 862133work01926 633561fax Self-cateringHideaway house is a lovely property which has been refurbished to a very high standard. It is situated in the centre of Wells- Next-The-Sea which is a popular seaside town on the beautiful North Norfolk coast. It is a perfect location for a holiday at any time of year and it is well served with restaurants, pubs and the local shops are just a stone's throw away. For those seeking a traditional holiday there is a wonderful sandy beach with multi coloured beach huts, boating lake, miniature railway and crabbing on the quay. The more energetic can enjoy sailing, wind-surfing and walking along the coastal path. Further afield, Holkham, Burnham Market, the seal colonies at Blakeney and the Georgian market town of Holt are all within easy reach. Sitting Room: A spacious room with French doors leading into the garden. It contains leather reclining sofas and chairs, a large flat screen TV with recordable 'FreeSat' and DVD plus CD/MP3 player. Free Wireless broadband internet access is also available (although cannot be guaranteed at all times). There is a wood burning stove for chilly evenings (logs provided). A good selection of books and DVD's are available for you to borrow as well as games and puzzles. Kitchen/Open Plan Dining Area: A bright and sunny room with Oak flooring. If you enjoy entertaining you will find the kitchen well equipped with good quality saucepans, knives and other utensils plus extras such as a hand blender, slow cooker, electric mixer, weighing scales etc. There is a Smeg range cooker, microwave, fridge/freezer with water dispenser, dishwasher, washing machine (Bosch) and tumble drier. We have provided cookery books and you will find herbs in our garden when in season. Wells has an excellent Deli, butcher, green grocer, baker and small supermarket. There is an Adnams Wine Merchants at Holkham. The dining room has a large refectory table seating eight and there is a good selection of glassware and crockery. Upstairs: There are four bedrooms and two bathrooms. All of the beds have good quality mattresses and are made up with crisp white percale bed linen. Soft fluffy white towels are provided for each guest. A 'taster' selection of toiletries from the 'Natural Soap Company', based in Wells, is provided. Bedroom 2: King size bed and storage. Sony iPod docking station / DAB Radio. Bedroom 3: Bunk beds and storage. This room has a nautical theme and a blackout Blind is fitted. Bedroom 4: With zip and link bed giving option of super-king or two single beds. Ample storage. Blackout linings and a separate blackout blind is fitted. Bathroom 2: Slipper bath with shower attachment. Storage cabinet, WC and basin. The south facing courtyard garden has a table with seating for eight and a sun parasol. It is fully secure and therefore suitable for children. A barbecue is provided for summer use. There is a pear tree and grapevine which you are welcome to help yourself to! There is a large playing field and children's playground five minute's walk away on Beach Road. Hideaway house is a lovely property which has been refurbished to a very high standard. 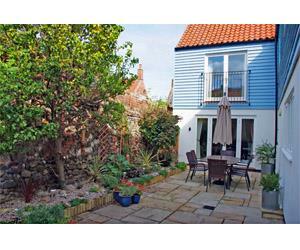 It is situated in the centre of Wells- Next-The-Sea which is a popular seaside town on the beautiful North Norfolk coast. It is a perfect location for a holiday at any time of year and it is well served with restaurants, pubs and the local shops are just a stone's throw away. For those seeking a traditional holiday there is a wonderful sandy beach with multi coloured beach huts, boating lake, miniature railway and crabbing on the quay. The more energetic can enjoy sailing, wind-surfing and walking along the coastal path. Further afield, Holkham, Burnham Market, the seal colonies at Blakeney and the Georgian market town of Holt are all within easy reach. Regrettably no pets please. Hideaway House and garden are non-smoking. Changeover day is usually Friday. Short breaks available on request. Take B1105 to Wells & Walsingham for approx 10 miles. Continue up hill (2 Furlong Hill) on outskirts of Wells. At top of hill, turn right into Mill Rd (signed the town, quay & beach). Continue on this road for .5 mile & take 1st left into Clubs Lane. At T junction take a diagonal left into Tunns Yard (to left of War Memorial). Parking on the right just after War Memorial club car park & entrance to house is immediately in front. Nearest railway station is Sheringham (15 miles). Sheringham-Norwich (1 hour), Norwich-London Liverpool St (2 hours) & Peterborough (1 hour) for details contact the National Rail Enquiry Line on 08457 484950 or Kings Lynn railway station ( approx 35 miles) connects to London Kings Cross (110 minutes ).